Have a listen to our recent interview on South East Radios Business Matters with Karl Fitzpatrick discussing Elevation Construction Network. 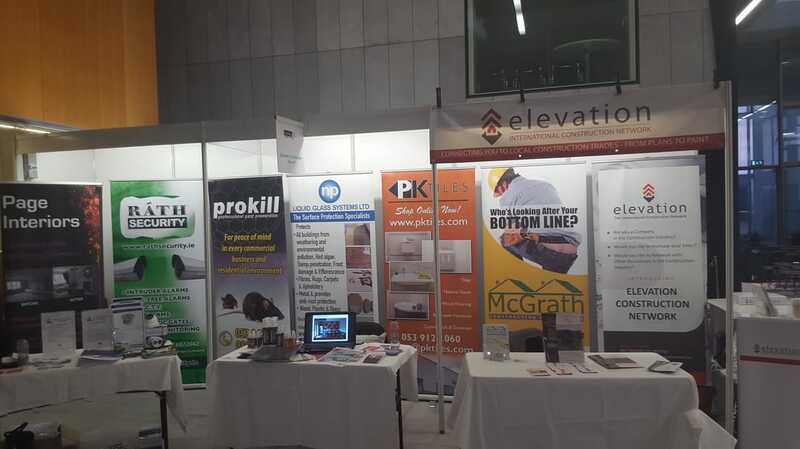 We attended the Wexford Business Expo 2016 as a member of Elevation Construction Network. We were a part of a group of 9 taking over several stands promoting our business and getting word out about Elevation Construction Network. The network is made up of over 30 indivdual trades from the construction industry and allows us to promote and refer each trade to our customers. It was a succesful event and we look forward to being back next year. 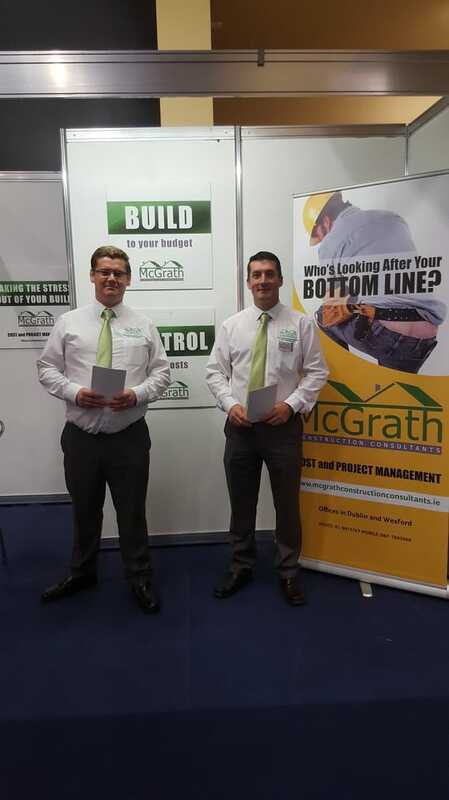 McGrath Construction Consultants had another successful year with our stand at the Self Build show in Citywest Hotel in October. If you are attending in 2017 be sure to keep an eye out for our team and come say hello. We will offer you advice and let you know what steps you need to take to build your dream home. McGrath Construction Consultants recently attended the inaugural Society of Chartered Surveyors of Ireland South East Dinner, which was a huge success. Click below to see the news article that was published by the Society of Chartered Surveyors of Ireland. Good growth in the Construction Sector as the first quarter of 2015 seen a significant increase in employment from the end of the previous year. Looking for that DIY project that isn't going to take up a massive amount of your time but still wanting to improve your home for the better? Check out these 41 DIY Home Improvement Hacks that will make things that bit easier while also adding that little bit of creative style to your home. The controversial Building Control (Amendment) Regulations 2014 have now applied to all commercial and residential development for a year or so and minister for the environment Alan Kelly is carrying out a review of their effectiveness. Click here for an overview on the Building Regulations﻿﻿. Company Director Ronan McGrath spoke to South East Radio on Alan Corcoran's Morning Mix at the Wexford Business Expo 2012. Ronan also spoke about how he feels more people are approching even the smallest of build projects with a much increased cost conscious approach and why more people than ever are using the services of a quantity surveyor. McGrath Construction Consultants have the pleasure to announce that we will be attending this years Wexford Business Expo. Author of ‘Stop Wasting Your Money’ and Irish Times journalist, Conor Pope. A consumer journalist and deputy editor of Ireland.com, the internet portal of the Irish Times, Conor is responsible for the ever-popular 'Pricewatch' page, which had appeared every Monday in the Irish Times for more than four years. He is a regular contributor to RTÉ Radio, Today FM and Newstalk. Eamon Fitzpatrick, The Irish Times Eamon Fitzpatrick began his career in radio in 1994 working for Dublin’s 98fm before joining 96fm as Sales Manager in 1996. From there, he went on to work on the successful launch of Today FM where he spent 12 years as Commercial Director. He was instrumental in developing and implementing the commercial strategy which led to Today FM’s success as a national broadcaster.He joined The Irish Times as Advertising & Sales Director in 2009 where he has helped restructure the advertising department in the face of economic downturn. Eamon is responsible for developing The Irish Times sales strategy to position the business for the future. He focuses on establishing the best structure and sales propositions to meet the evolving needs of existing and future customers. McGrath Construction Consultants have the pleasure of announcing that we have been appointed as Quantity Surveyors and Project Managers for a large renovation / extension project in Sandyford. The Project will involve an attic conversion, increasing the BER rating of the home via the building fabric and the complete overhaul of the Mechanical and Electrical systems (including installing solar panels). McGrath Construction Consultants will be responsible for preparing a Bill of Quantities for discussion with the client. At this point we will forecast the cost of the project and ensure that this fits with the client's budget and their vision / expectations for their project. Should the project be over budget at this stage McGrath Construction Consultants will then Value Engineer the project to reduce costs to align the project with the outlined budget. The final Bill of Quantities will then be prepared and sent out to the various contractors along with very detailed and secure tender documents. Once the tenders are returned, McGrath Construction Consultants will then analyse the returned tenders in great detail. McGrath Construction Consultants will make a recommendation to the client on which contractor to appoint based on very specific information gathered from the tenders and company screening. The chosen contractor will then be required to sign a contract specifying the contract price and duration of the project and provide documents to the client before any work can begin on site. During the construction phase of the project, McGrath Construction Consultants will supervise the quality of the work on site and manage the progress of the works. McGrath Construction Consultants will be responsible for managing interim payments to the contractor and management of any nominated sub trades (specialist items). At all times McGrath Construction Consultants will be responsible for protecting the clients interest and ensuring the client is getting value for money. Project Duration will be 5 months.